Five Points Festival: Get Tickets to the New Comic-Con in NYC! Midtown Comics is proud to present the Five Points Festival, a designer toy and comic art convention debuting May 20-21 right in Lower Manhattan! A showcase of artists, designers, publishers, writers, and toy brands, Five Points is a place for comic fans, collectors, and anyone interested in independent art! Guests include Bryan Lee O’Malley, Scott Snyder, Greg Capullo, Dan Slott, Sean Gordon Murphy, Simone Legno, Nick Spencer, Matthew Rosenberg, Mike Hawthorne, and Ron English – more comic creators will be announced, too! Tickets are available online, and now available in-store at all Midtown Comics locations! This is the very first edition of the Five Points Festival, and you definitely won’t want to miss it! Without a doubt, this will be the best place to be in NYC on May 20-21! Win 2 Tickets to East Coast ComiCon 2016! Midtown Comics has created a new contest for you to enter with the help of East Coast ComiCon 2016! This time, we’re giving away pairs of tickets to East Coast ComicCon 2016 at the Meadowlands Expo Center in NJ! We have several pairs of Sunday tickets (04/17/16) to give away to some lucky winners! Winners must be able to pick up their tickets in person at Midtown Comics Times Square. Find more info on the con here! This contest will last from 03/08/16 – 03/29/16. You can submit multiple entries by Liking our page on Facebook, Following us on Twitter, Subscribing to our newsletter, Following us on Pinterest, and Tweeting at us daily about the contest. To earn additional entries and increase your chances of winning, you can follow us on Twitter and tweet, “I just entered to win two free tickets to @EastCoastConNJ from @MidtownComics! #ECCC2016”. You can then submit the URL of your Tweet to Rafflecopter. Please note, that you can only tweet this once per day. You can subscribe to our mailing list! NYCC 2015 Video Coverage from Midtown Comics! New York Comic Con 2015 is finally over, and we have some great Midtown Comics Exclusive Videos to share with you! Check them out below, and make sure to subscribe to our YouTube Channel to keep up-to-date on all things Midtown! Hey Mighty Midtowners! As you likely know by now, the enormous and oh-so-exciting New York Comic Con 2015 is almost here! From October 8th-11th, the Javits Center will be filled with a sea of fans – each one anxious to see what kind of things they can purchase and thoroughly excited to attend panels. Obviously, one mandatory stop is OUR booth! We’re located at #2036 and we’ll have 20% OFF all comics and graphic novels, and some VERY cool exclusives. Pretty awesome, right? Touring the floor is always good fun, but if you’ve ever been to NYCC before, you know it’s important to plan ahead! 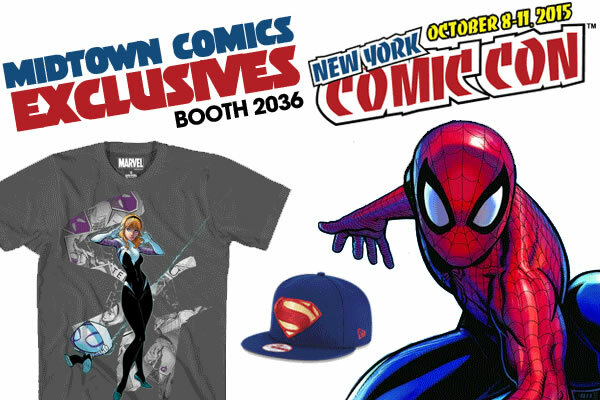 So, we here at Midtown Comics want to make sure you’re prepared for all that NYCC will have to offer! There’s of course PLENTY to check out, but we’ve found 10 panels that we think are very deserving of your time. After you’ve read our suggestions, chime in with your NYCC schedule in the comments – you just may motivate someone else to attend a panel!